Upbeat, crazy and colourful; welcome to the creations of Cara Carmina and this week's workbox introduction! "Oh the sweet sound of the sewing machine!" 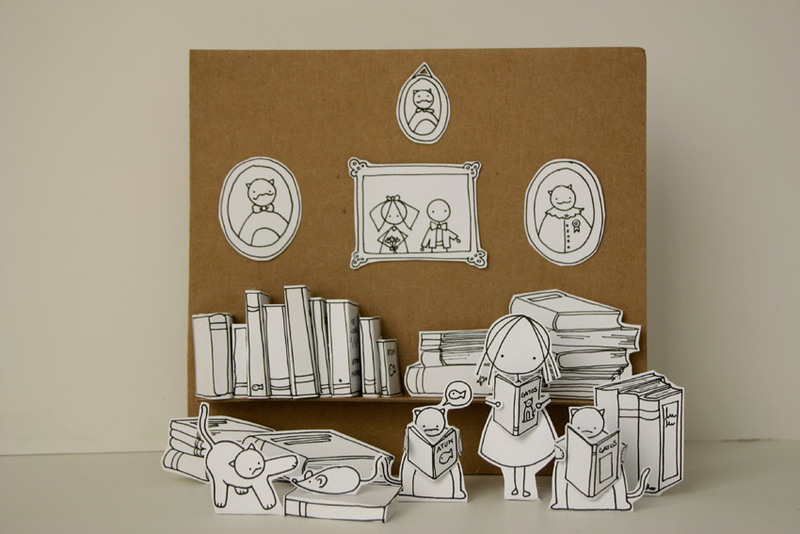 Norma, also a painter and childrens illustrator (see her cheerfully illustrated diorama below), is orginally from Mexico but now lives in Canada. She is based in Montreal with her husband and tribe of cats: Metaphore, Lola, Puccini and Sarcasm (the cats make regular guest appearances on her Facebook feed too). 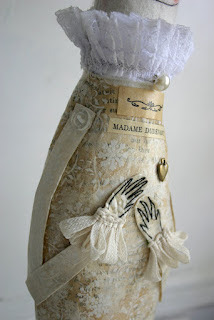 Norma is fond of strong characters from history finding inspiration in people such as French author Madame Dudevant, who often find their way into her work. However, the other love of Norma's life is Frida - Frida Kahlo, the Mexican artist perhaps most famous for her self-portraits painted in a richly-coloured naiive style. 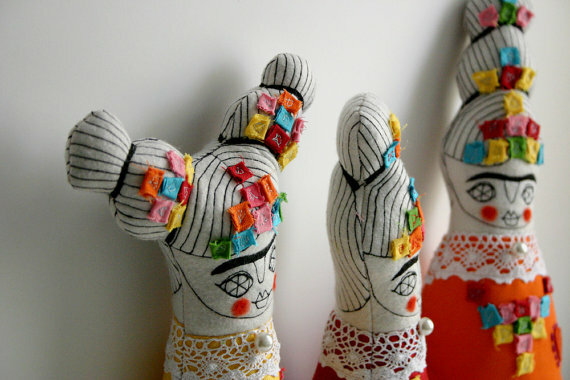 In the photo's above and right, you can see the beautifully detailed examples of Norma's Frida dolls which are created using both free machine and handstitch techniques. You might ask what or where the name Cara Carmina comes from? In a nutshell, it is a term which Norma has coined to combine her favourite things and which roughly translated would mean, 'dear red little thing.'. This phrase is represented by a little red ladybird symbol - a creature which Norma considers to be lucky. "Cara Carmina is my dream, a place where I create and dream." "It's an ordered mess but I know where everything is.". Move it at your peril - you have been warned! 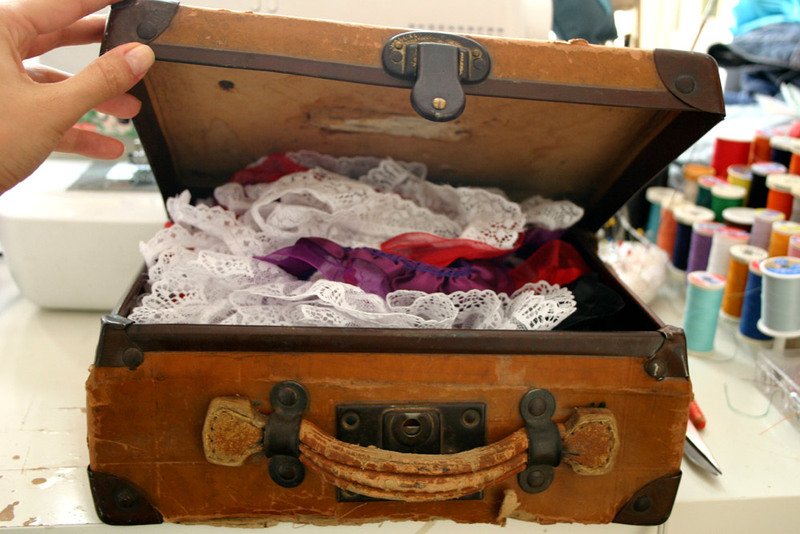 Space is limited in the Cara Carmina workshop so materials and supplies are kept in an ecclectic mix of bags, boxes and the delightfully battered, vintage suitcase above, which is where the lace for outfits for dolls such as Frida are kept. 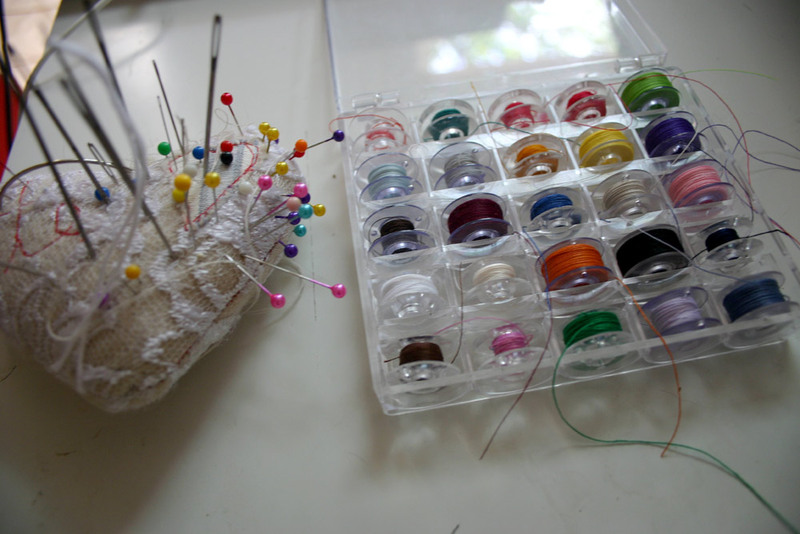 Left; the colourful bobbins box and a lace heart which Norma made for her favourite needles. From here you can imagine you are sitting at Norma's desk with Mr Maple (the beautiful tree outside the window) looking on whilst you work. Also looking on are Otto & Ana, perched on the pencil pot. 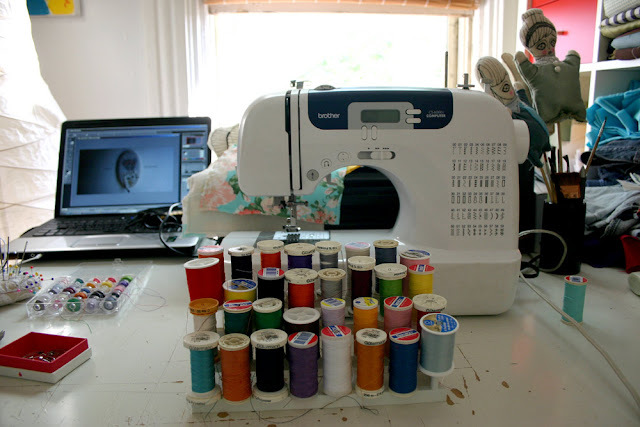 You can see the sewing machine up front and ready for action, the recently acquired tidy spool holder poised to offer the thread required and laptop on red alert for Norma to share her latest new find or creative idea. Norma loves storage boxes of all shapes and sizes, which, when space is limited a lot of us can identify with. 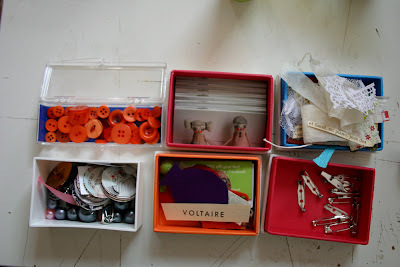 Some of you might recognise these tiny boxes from Moo.com? 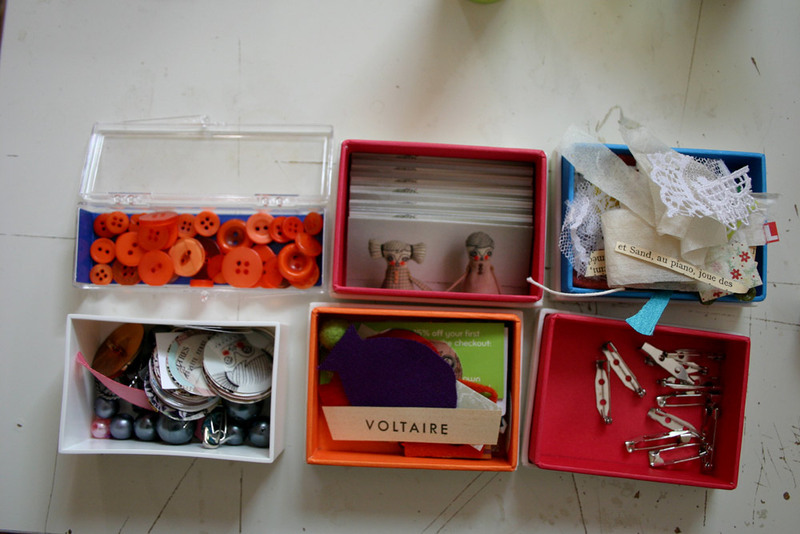 This collection of Mini Moo business card boxes are home to teeny scraps of things; words torn from books, small buttons, lace offcuts and beads. Small treasures. "Yes, I even love little prescription containers - these are just perfect for my collection of tiny buttons." Here are Norma's collection of paintbrushes, of which she is very fond. 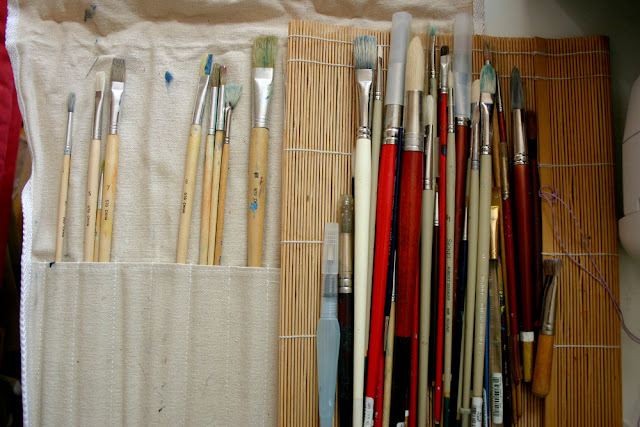 They have been accumulated over a long period of time, at some expense, and are important tools in her illustration work. "My most precious number one pair of scissors. Cannot live without them! My loop turner (the loooong tool with a loop at the end) fantastic for turning my long Frida legs inside out. 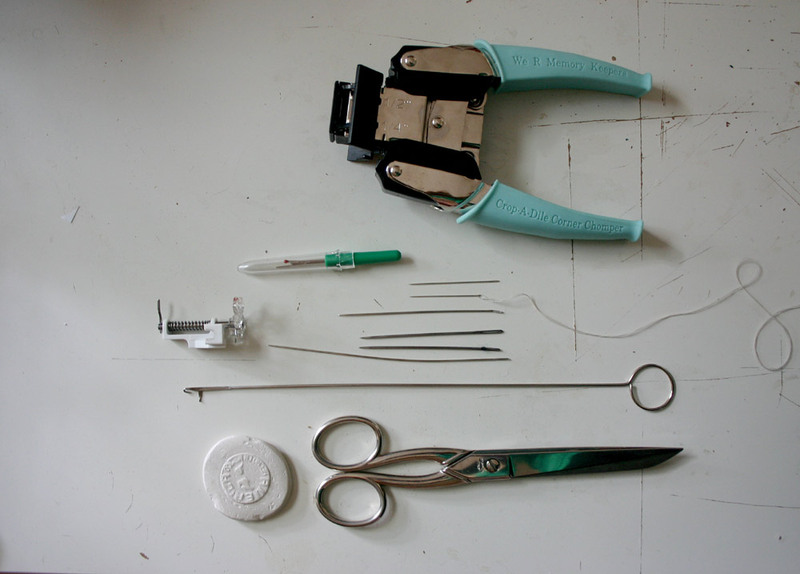 My corner round cutter, my needles (I love the longest one is quite useful!) but I use them all for different purposes... the tiny, super thin ones are soooo precious to me too! 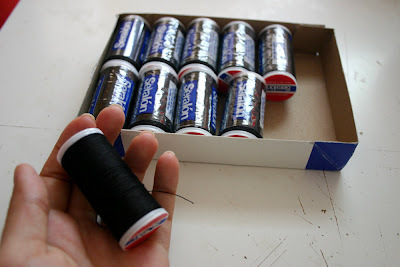 Also my adapter to sew thicker fabrics for my sewing machine! (perfect for closing dolls when I fill them!). The little tool to un-sew wrong stitches (don`t know what`s that called... unsewer? maybe?) ;) and the white chalk for marking fabrics. 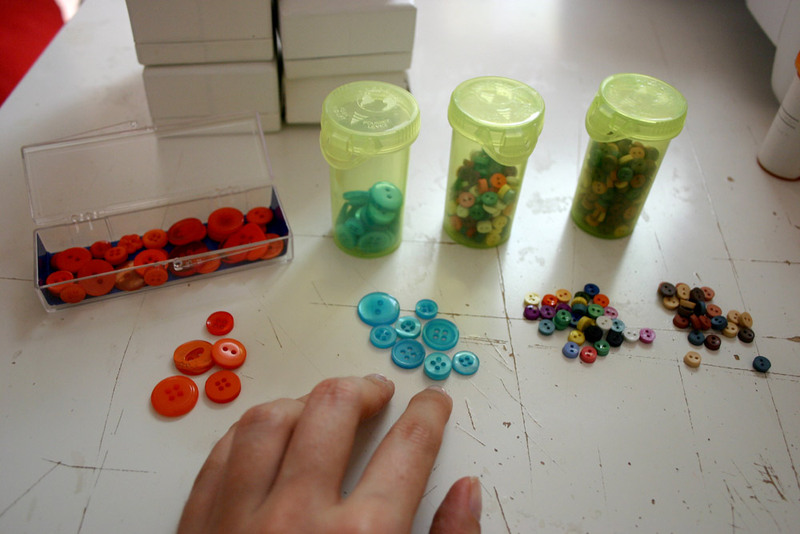 All of these are sooooooo useful and make my work so much easier!" Black thread is one of the key materials Norma uses in her work. "I buy boxes and boxes of it whenever I go to Mexico where it is much cheaper. 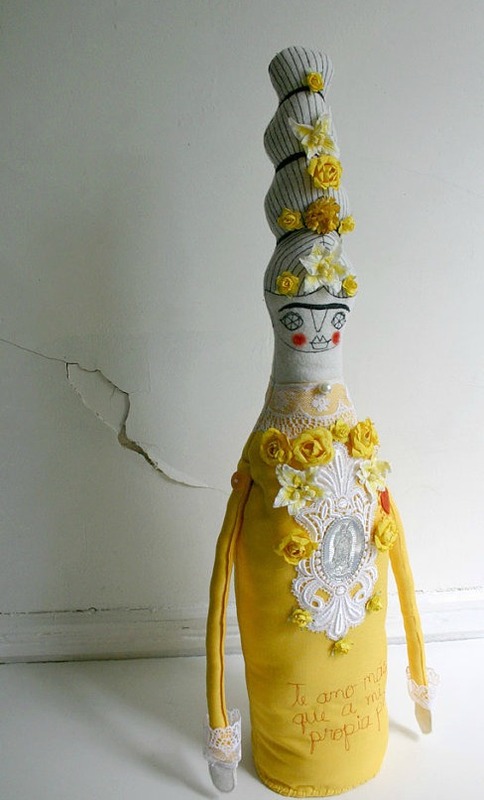 I use it to draw the faces and hair on my dolls and for other things in my textile collage work." 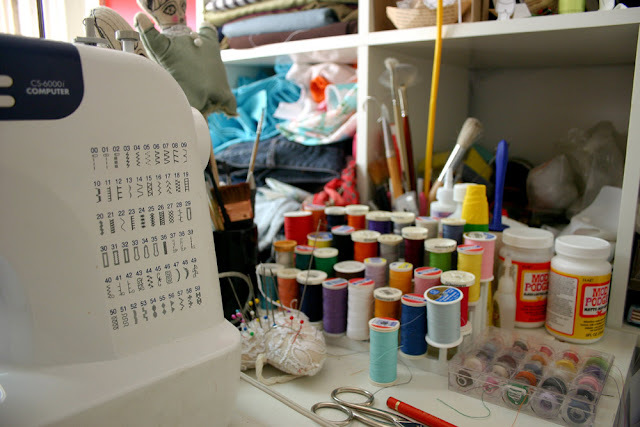 Norma's Brother CS-6000i sewing machine - her 'number one' most used and prized tool, with a queue of Fridas waiting to be stitched together. 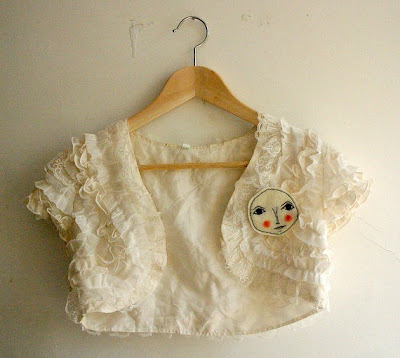 "When I bought the machine I didn´t know how to use it, in fact, I had never touched a sewing machine before!! I read the instructions and began to play around with it, so yes I`m a self taught doll maker! I love to learn how to do things by myself and to discover new techniques. I learned my "drawing" technique by myself. I was inspired by the work of other artists I saw who were stitching words and lovely things (like Cathy Cullis and Christina Romeo... oh oh oh such a huge inspiration in my work!) and I wanted to do that! Now I can draw well with the sewing machine even in small format. 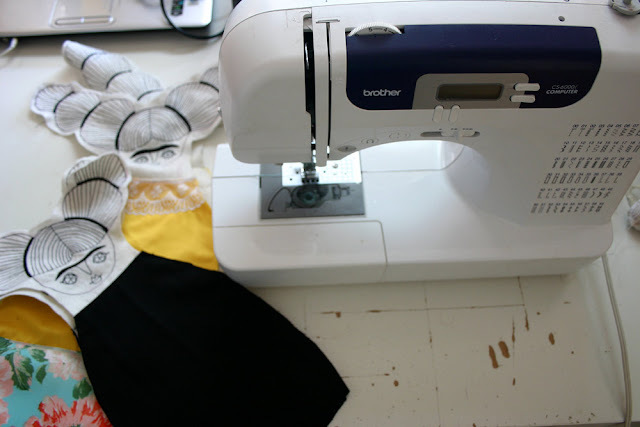 I just love my sewing machine - it has never broken or stopped working since I bought it in 2007. I love how it stitches, it's very nice and easy to use! "It's the first time I give away this secret! I love the way it draws on the fabric and I only use these two colours! 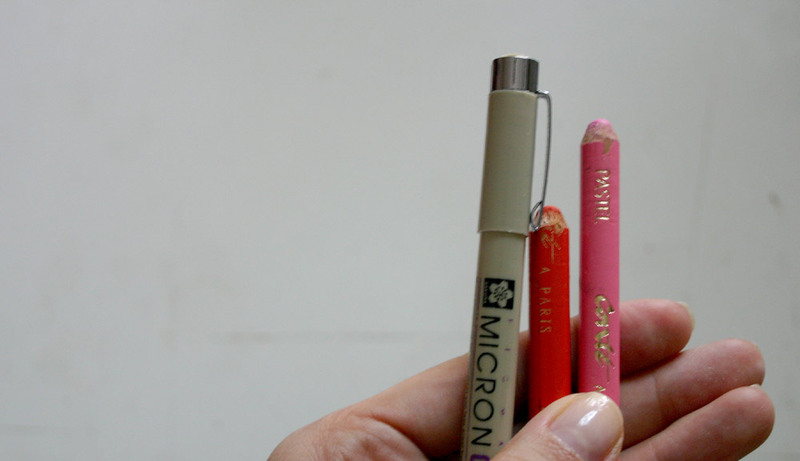 Also my Sakura number 5 black marker which is the one I use to draw my dioramas." So now you know but, shush, don't tell everyone! All of the photo's used in this post belong to Norma Andreu, who we thank HUGELY for allowing us permission to use them here and who has been a pleasure to work with. Thank you! On an apple tree covered hill near a winding 'Shire river sits the workshop of Murgatroyd & Bean. Murgatroyd (the Owl) & Bean (the Hare) have known each other since they were but a chick and a leveret. At a young age they were apprenticed to the applewood's needlesmith, Meles-Meles the badger, where they learnt their stitch craft and became friends with the stitch-fingered Human, Kathleen. In their workshop they make curiosities from found materials, handstitch and embroidery, inspired by the surrounding landscape and tales from the Wood.